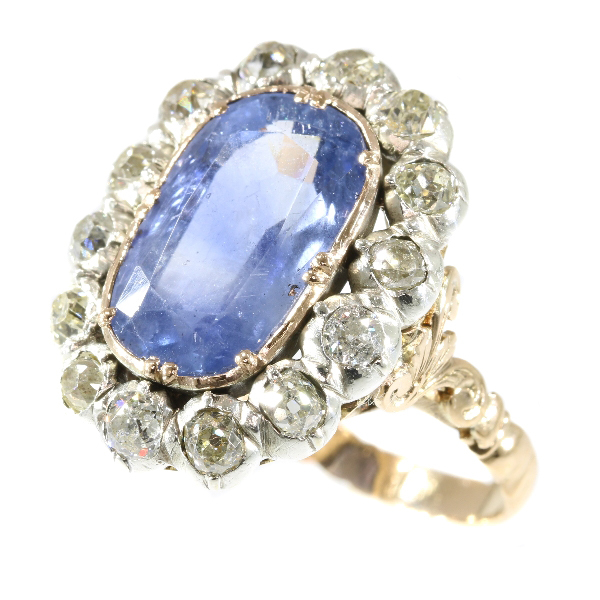 Late Victorian diamond sapphire ring with big untreated natural sapphire: Description by Adin Antique Jewelry. Style: Late-Victorian - Victorian decorative arts refers to the style of decorative arts during the Victorian era. The Victorian era is known for its eclectic revival and interpretation of historic styles and the introduction of cross-cultural influences from the middle east and Asia in furniture, fittings, and Interior decoration. Victorian design is widely viewed as having indulged in a regrettable excess of ornament. The Arts and Crafts movement, the aesthetic movement, Anglo-Japanese style, and Art Nouveau style have their beginnings in the late Victorian era. Extra information: Betrothal rings were used during Roman times, but weren't generally revived in the Western world until the 13th century. The first well-documented use of a diamond ring to signify engagement was by the Archduke Maximilian of Austria in imperial court of Vienna in 1477, upon his betrothal to Mary of Burgundy. Diamond(s): 14 old brilliant cut diamonds with an estimated weight of ± 1.40ct. (colour and clarity: J/L, si/i). Precious stones: One natural sapphire with an estimated weight of ± 9.35ct.